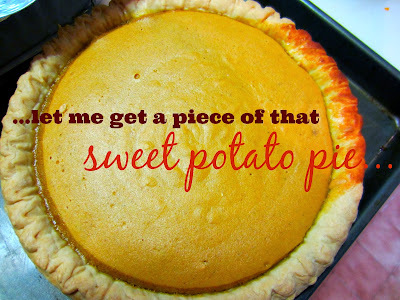 I love sweet potato pie. It's the only pie I will ever eat (on purpose). I am not a fan of pie in general. I don't care for the crust, the filling (be it fruit, vegetable or mineral). I know this revelation will be a disappointment to my friend and cookbook author, Nancie McDermott, but 'tis true. I prefer cake. Lucky for me, Nancie also wrote a cake cookbook, so methinks she won't be too cross with me. Since I don't care for pie, it's got to be a special occasion for me to eat it. Thanksgiving is a good enough reason as any to stuff my face with it! I took an informal poll on Facebook about which fall pie is better. Sweet Potato or Pumpkin. Actually, I declared sweet potato superior and others weighed in. Most of the responses named other pies as best. The most popular (and one I've never eaten because of my allergy), Pecan Pie. So, for all of you Pecan Pie lovers, here is the one and only pic I will ever post of one. I will, however, post my favorite Sweet Potato Pie recipe. It strikes a perfect balance of sugar, creaminess and it still lets the sweet potatoes shine without being strangled with Fall-inspired spices. Enjoy. In a bowl, cream butter and sugars together. Add eggs one at a time; mix until all are incorporated. Add milk, sweet potatoes, lemon zest, vanilla, ginger, cinnamon, nutmeg and salt; mix well. Divide mixture and pour into 2 pie shells. Bake at 350°F for 35-40 minutes or until a knife inserted near the center comes out clean. Cool. I'm with you... I cannot stand pie. I dislike the crust VERY much and prefer cake to pie every day! I will poke my fork into some pumpkin pie but only if it's covered in whipped cream. Not a fan of pie?! Janet (commenter above) "cannot stand pie"?! How can that be?! More often than not, the crust is awful. The filling is soggy or too sweet. Pie almost never tastes good.